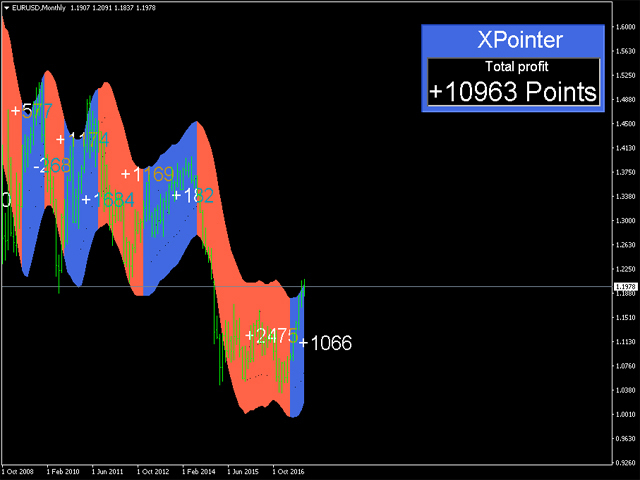 XPointer is a completely ready trading system. It shows the trader when to open and close a trade. It works on all currency pairs and all time frames. Very easy to use and does not require additional indicators for its operation. Even a beginner trader can start working with XPointer. But it will also be useful for professional traders to confirm the opening of orders. It does not redraw its values. It works on all currency pairs and all time frames. It has almost no lag of signals. Completely ready-made trading system. All you have to do is open and close trades based on the indicator signals. As soon as a blue channel appears, open a buy trade. If there is an existing sell order, close it. As soon as a red channel appears, open a sell trade. If there is an existing buy order, close it. As you can see, everything is very simple. No additional indicators or trading systems should be used. Date_start - date for the indicator to start working. If you specify a date that has no bars available in the terminal, the indicator automatically turns off. Periods - indicator calculation period. color_buy - color of the channel for buying. color_sell - color of the channel for selling. 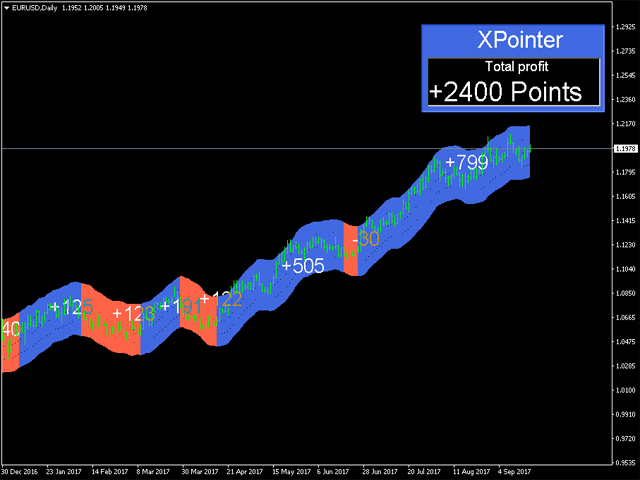 color_point - color of information on profit/loss. size_font_point - indicator font size. rect_color - external color of the information panel. rect_color1 - internal color of the information panel. on_inform - display the information panel on the chart. I have tested a multitude of indicators. I have bought nearly all the PipFinite indicators. I have rented currency strength indicators. You name it, I have bought it. I have tested it. I have wasted a lot of time and money. That was until I found XPointer. I have tested this thoroughly. For manual trading, this is way better than PipFinite's Trend Laser. It detects trend reversals more reliably. I have managed to find an extra filter that makes this indicator nearly 100% accurate. This is THE BEST indicator out there.